Creative cultures have one thing in common, they have a lot of ideas! The problem is most teams don’t have a finely tuned process in place to share, respond, and test their ideas. This can lead to disengagement when voices are buried, and creative expression is stifled. At Culture Summit, Hung and I ran up against the same challenge not too long ago. Whether it’s enhancing the conference, or engaging the community – we both have lots of ideas. We realized that we approached design and testing differently. Hung is passionate about Lean Startup, and I love Design Thinking. While we had different tools and methodologies to work with, we didn’t have a unified approach. And it created several head-butting and not so fun moments. We recognized that we each brought a different approach based on our experience and instead of trying to enforce one style over the other, we looked at how we could embrace our uniqueness. No matter what industry you work in, ideas are delicate. When an idea is first born, it can be killed easily by the initial response. Everyone has an idea-response they default to that is often unconscious. This usually stems from previous experience in our careers. Do any of these idea-responses sound familiar to you? These type of responses nip ideas in the bud when ideas need help to bloom. Most of the time it’s not even intentional. Over the last month, we have been testing out a few different approaches to how we manage our ideas and came up with a process we love. We’re now feeling more inspired, engaged, and collaborating more than ever. And we’d like to share our Culture Summit Creative Idea Management process with you. This kind of organic idea sharing is good, natural, and healthy to let flow, but sometimes, it’s not always the right moment to share an idea. 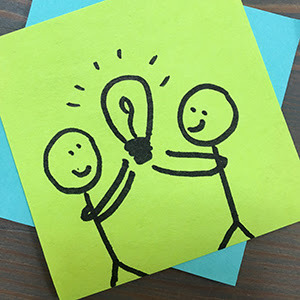 When a team is deep in implementation and execution, bouncing around ideas might derail productivity because of unintentional context switching. We’ve found it helpful to do the wildly innovative thing and just ask before sharing. Here’s what it looks like in practice. We were currently deep in a task, so the moment wasn’t opportune. Instead, we put the idea on hold and came back to it later. Practice tip: If you agree to put the idea on hold, be sure to loop back to it later. Think of it as putting your idea in a greenhouse. It goes there to incubate, but if you don’t come back to it, it will wither and die. Brainstorming ideas is a divergent process. In this phase, your goal is to come up with as many ideas as possible. There are no bad ideas so let your mind run wild. After you’ve got an abundance of ideas, then it’s time to converge or come together. Select a few ideas to consider and test. The diversity of ideas mixed together is where the magic happens. We were brainstorming ideas on how to engage with you, our community. We created an idea board and challenged each other to add at least 30 ideas (good or bad) over the course of the week. We then came together in person to sort and select our top two. We looked over the list and asked each other questions about the ones that caught our attention. It was easy for us to see where we had alignment and which ideas resonated with us the most. 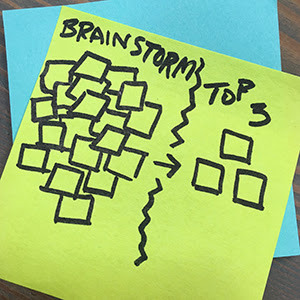 Equipped with our top two ideas, we had completed the first phase of the brainstorming cycle. Now we needed to vet how to move the idea into implementation. We used the Disney Method where we used three different perspectives to assess our ideas. Dreamers: Dream up the best case scenario if this idea is fully realized. What’s the ‘shoot for the moon’ type of outcome you’d like? Realizers: How would you bring an idea to life? Look at how the idea can be put into action. What would be the first step? What are all the pieces that need to be considered? Critics: Review the plan and search for weaknesses, obstacles, and risks. Discuss the pitfalls and how to address them. Having pitfalls doesn’t mean you shouldn’t move forward. Critics seek to improve the plan. This exercise of the Disney Method helps everyone consider the multiple perspectives that help support the success of an idea. If an idea has made it this far, it’s time to test and put it in motion. When we test ideas, we break the plan of action down into the smallest slice possible that allows us to get the most amount of learning. If the answer is no, then we make the slice bigger. What is the biggest piece you could move forward with now? What is the absolutely smallest? And what would be in the middle? Remember, people in your team will show up with different approaches and experience. Supporting and building on ideas helps to create psychological safety and trust in teams. According to Forbes, agility to how we manage change is one of the top four soft skills in demand for careers in 2017. As cliché as they may sound, there’s truth to these phrases. As organizations become agile and move faster, the annual performance review has become outdated. Is your organization considering shifting from an annual performance review cycle to a real-time feedback approach? If so, I’m going to walk you through a tactical example of using design thinking to navigate culture change, as you move from annual performance reviews to real-time feedback. A process and methodology, or set of practices outlined in 5 different phases; empathize, define, ideate, prototype, test. The purpose of design thinking is to solve problems and address unmet needs by exploring the possibilities of what could be. It’s not a skill you master, but instead a lifelong practice. Ready to get started? Good, let’s put our design thinking hats on. 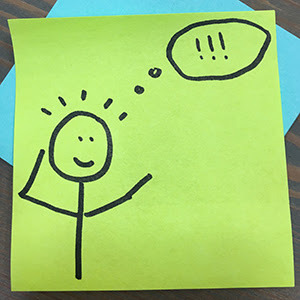 An empathy map is a popular tool used by design thinkers and agile practitioners. However, average people like me and you can use it too. It’s a 4-quadrant graph where you outline what your customer or stakeholder say, do, think, feel. Download your copy from Stanford d.School here. Using our example of moving away from annual performance reviews to real-time feedback, many people in your organization will have questions around how this is going to be implemented and rolled out. Over the coming weeks, start observing and documenting what people say, do, think, and feel using an empathy map to gain deeper insight. Using an empathy map allows you to immerse yourself in the culture of your organization as you’re going through this huge change. In the next step, we’ll look at how you can use the data gathered from your empathy map. Once you’ve created your empathy map, review it and look at what the “needs” are. Those are easy to find as they’re usually verbs. When you have the “needs,” you can begin using them to identify insights. Remember: Be careful to avoid coming up with solutions at this point. Solutions are generally seen as the nouns in empathy maps. With the “needs” identified, we can begin exploring the why of each need to uncover more insights. Why do they need clarification? Why do they need to understand? Why do they need to ask questions? Example: My team needs to find a way to clarify and understand the new feedback system because they are feeling uncertain about the impact it will have on our culture. In the next step, we’ll look at how to begin solutioning with our newfound insight. With our newfound insight, we can now reframe this into a “How might we…” question or HMW for short. Asking an HMW question switches your neural pathways from a stagnant, fixed state to a creative state. Get those creative juices flowing by asking more HMW questions. How might we clarify, communicate and answer questions so that we can align our team and create a new feedback and recognition culture? The design thinking process follows a diverge-converge-diverge-converge rhythm. In this step, our HMW question is convergence. We have figured out the questions to ask, now let’s explore some possible answers. This moves us back to a divergence where we want to create more choices. So, let’s bust out the post-it notes because we are ready to brainstorm! Pro Tip: Involve your team and brainstorm together during a meeting. If you have remote colleagues, do so on a wiki. There are no wrong or bad ideas in a brainstorm. The goal is to get all the most outlandish, wild, and wonderful ideas out there. Prototype the experience with whatever you have at your disposal; Legos, Play-Doh, sketch boarding, or whatever your fancy! Prototyping is the moment to play out what the experience might look like. You want to do this for two reasons. First, prototyping allows you to find the quickest path to direct experience so that you can learn the things you need to learn. Second, doing is the best kind of thinking. We’re so used to thinking before doing, when in fact, we learn the most by doing. Using our example, work with your team to create a story on what rolling out real-time feedback will be like. This allows everyone to envision the experience. Put your HMW question up on the whiteboard, throw materials on the table, and give your team the opportunity to prototype. Once you’ve gotten a chance to prototype what the experience will be like, invite a colleague who was not involved in the design process. Walk them through your prototype experience and treat them as your first user. Have others on your team to watch, observe and take notes. 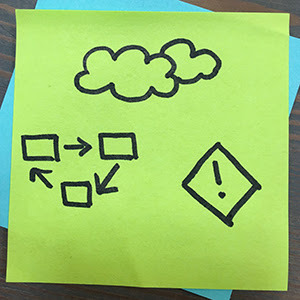 Loop back to your empathy map and gather new insights as you go through this iteration. At Culture Summit, we like to use a tool called Scatterspoke for our retrospectives. From here you can decide if your design might need some tweaking, launch a new iteration, or use the insights to help with implementation. It will be up to you and your team to know what’s the best next step based on the learnings you were able to uncover.